Finally, there is a book on Lean leadership for executives. Bob Emiliani, the author of the Real Lean series of books, has revealed the secrets of Lean management. 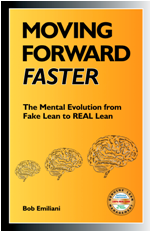 Moving Forward Faster, The Mental Evolution from Fake Lean to REAL Lean explains the advantage of Lean management over conventional managment. Bob looks at the economic, social, political, and historical aspects of Lean management that very few think about. These provide a much better explanation for why there is a lack of success in many Lean transformations. Based on his observations and research there are 85 items that represent most of the fundamental knowledge that Lean pratitioners lack yet must become aware of in order to succeed long-term. Bob has compiled this comprehensive guide so that we may learn how to evolve our thinking from the modified versions of Lean seen in many organizations to REAL Lean. One based on continuous improvement and respect for people. This book is written for the executive levels of organizations but others leading Lean transformations will also find this useful. It is intentionally a quick easy read with each chapter consisting of a short statement followed by bullet points describing how each statement is inconsistent with Lean management. The resulting thinking behind each statement however will keep you intrigued for a long time. The book is printed in color which brings the element of visual management into your learning. Bob suggest that these 85 items can used to assess and diagnose problems with your Lean transformation. Each of these problems serves as a starting point for root cause analysis and the identification of practical countermeasures. You can also use it to help identify causese of failures in other organizations. In his final words, Bob challenges executives to further commit to to studying and learning Lean by practicing the ideas in this book. One of the most important duties of executives is making decisions. In the appendix of this book Bob explains a process for completing a failure analysis. Learning from our mistakes and those from others is crtical to success. I highly recommend Moving Forward Faster as a guide for your Lean transformation. This is a resource I am sure you will continually reflect upon in your own journey. I know I will. If you want to understand what REAL Lean is and how to support it or lead it in your organization then this book will be a must read for you. Get your color copy today. Note: The author provided me a copy of this book for review.